Shop for everyone on your gift list this holiday at smile.amazon.com and Amazon will donate to Red Raiders Band Boosters! Register RRBB as your charitable organization of choice. We are in need of student and parent volunteers for Fruit and Kringle Distribution on Saturday. Students- can sign-up to help with distribution outside the Band Room. On Saturday Students should report at 7:45am to the Band Room (Door labeled S16) Pick-Up is scheduled until 1:00, we are usually cleaned up and done by 1:30pm. Students that volunteer will receive band points. Parents are needed to help sort Kringle orders. We need 4-5 parents to come from 7:45am-9:30am to help sort Kringle orders. Parents- please e-mail Joellen Haberlie (joellen_habe@hotmail.com) if you are interested in volunteering. All volunteers should dress warm! The door to the band room will be opening and closing the majority of the morning. You must come pick up your fruit and kringle, it will not be stored in a temperature controlled environment overnight. Please pull up to the Milwaukee Ave. Band room door labeled S16. Put your flashers on and come on inside to check in, then our volunteers will bring your items outside and load them right in to your car! Our Winter Concert will be on Wednesday, December 20th, 2017 at 7:00pm in the Dale K. Hidde Theatre. Concert attire is all black. Please note if your student is a Freshmen, high school attire is different than middle school. Plan ahead to make sure your student is wearing ALL black. Also, be sure to encourage your student to plan ahead should they need to use their marching shoes as footwear. Ladies: Black pants, black pants, black skirt, black nylons/tights, black 3/4 shirt or long sleeve shirt. Ladies, you must wear a cardigan if you are wearing a tank top, short sleeves or sleeveless dress. Please also remember that you will be up onstage and the audience will be looking up at you, be aware of your outfit. No patterned shirts or tank tops. Gentlemen: Black Pants, black socks, black shoes, black long sleeve dress shirt. No short sleeve shirts, striped shirts or colored ties! Students can bring festive attire for our combined finale performance of Sleigh Ride. There will be no Jazz II or III Thursday, December 21st. Regular rehearsal will resume after the break. Jazz II and III are swanging! Both groups rehearse on Tuesdays and Thursdays at 7:00am. Please make sure if you are not going to present that you are communicating attendance with Mr. Krubsack and Mrs. Lato. The Wauwatosa East Red Raider Pep Band performs at six Basketball Pep Bands throughout the Boys and Girls Varsity season. To lower the commitment for our students we have divided the band in to three groups. Each 'band' (Red, White, Black) attends two pep band performances. Report time for all games is 6:45pm, in the band room. Students- If you are unable to attend a game it is your job to find a person that plays the same instrument to switch with you. Switches must be communicated to Mrs. Lato. Switches can only occur because of a conflict. Students can attend more than their scheduled pep bands, for each additional pep band attended students will receive 25 points towards their Varsity letter. Attendance is taken at every game at the beginning and during halftime. You must be seated with the band and stay through 3rd quarter to receive credit for the performance. 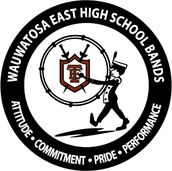 EXTRA PEP BAND (Band Points) OPPORTUNITY! January 25th for the HOCKEY game. Sign-up posted outside the band room. Space is limited!! We need balanced instrumentation to perform. Transportation to and from East will be provided. July 4th, 2018 Fourth of July Parade, report 7:30am. WE ARE FIRST!!! The Wauwatosa East Red Raider Marching Band is under the direction of Jennifer Lato and Jeff Krubsack.